Jumbo Kale Chips are beyond simple and loaded w/ vitamins & minerals. 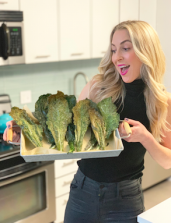 They’re a super time saver because all you’re doing is putting a few big kale leaves on a pan…instead of traditional recipes where you are fussing with a bunch of little kale pieces. Plus, it looks FUN to have these BIG leaves. 1. Preheat oven to 300 degrees F. Rinse & dry kale leaves. Rub a little bit of avocado oil or extra virgin olive oil on the leaves w/ your hands or a pastry brush. 2. Put the leaves on two parchment paper-lined baking sheets in a single layer. Don’t overlap them, they need their space to get crisp*. 3. Sprinkle w/ sea salt & bake for 18-20 minutes. Remove from the oven & let cool for 5 minutes. 4. Enjoy as a snack or serve along side a sammie. *CRISPY TIP: The stem in the middle doesn’t get crisp! Just eat the crispy chip around that stem OR after they’re cooked crack the leaves off the stem into big chip pieces. These kale chips taste great w/ just a little sea salt, but sometimes it’s nice to flavorize. After rubbing the kale leaves with oil, sprinkle w/ nutritional yeast (found in the bulk aisle of healthfood stores). It’s a great vegan swap for parmesan cheese. Leafy GREENS energize you. To learn how they work their MAGIC inside of your body, I created a detailed infographic all about GREENS! Click >>HERE<< for FULL infographic.